Near me, Nearby, Closest…these words are becoming increasingly common across the billions of queries on Google every month. Thanks to mobile phones and iPads, we can quickly and easily find things around us when we want or need them. Google searches for “locations near me” are growing rapidly, and so are consumer expectations. The fact is we want instant gratification, even when we are searching. Whether you’re a global brand or a local business, you must deliver on search requests in the moments that matter. However, when using these types of keywords consumers are still being directed to locations that do not exist! Perhaps the business has moved, or their listing just plain has the wrong data. If this has happened to you how did you feel? Probably like the 67% of shoppers who say they lose trust in a business when they get lost trying to find it. Since every business wants to build good customer relationships and earn consumer trust, it’s critical to maintain accurate location details and driving directions online. This starts with having a consistent online presence and citations across the web, but expands to the website of the business or brand, and much more. Unfortunately, this is easier said than done – especially for multi-location brands managing location data for stores all over the county, state, or country. Managing this data is tedious, time-consuming, and can be a real challenge. Some brands are still using spreadsheets and are having trouble keeping up with all the acquisitions, mergers, and openings and closing of store locations. At Advice Local we make creating solutions for our partners a priority. That is why we developed our guide for putting multi-location businesses and brands on the map. Local presence management can and does get very complicated for businesses that are “local” to more than one geographic area – but we’re here to help. Let’s talk more about how adding a dynamic store locator solves these issues. Store locators help businesses with multiple locations get found by local customers – both online and off! Adding a store locator map to a brand’s website allows customers to easily search for nearby locations. On-the-go mobile shoppers can quickly find the closest or most convenient location to visit without ever leaving the website. A quality store locator map will show a pin for every nearby store, so the user can easily visualize where it’s located, how close they are to it, and see how to get there. Customers can simply click on a pin or location name to get more details, including directions, contact information, store hours, and any other information the business owner chooses to display. Beyond making it easy for customers to find the closest location, a quality store locator will create location landing pages for each location. These pages help each individual location to rank higher in search results. When a consumer searches on mobile for a specific product or service, the likelihood that the business will appear is increased exponentially. Our product, Advice Locator Pages, generates a unique location landing page for each location. Each page is automatically optimized for SEO, which means more potential customers can discover the business through local desktop and mobile search. Advice Local has been putting multi-location businesses on the map for some time. We understand what it takes to manage their online data, connect with nearby customers, and rank in local searches. Want or need additional information? 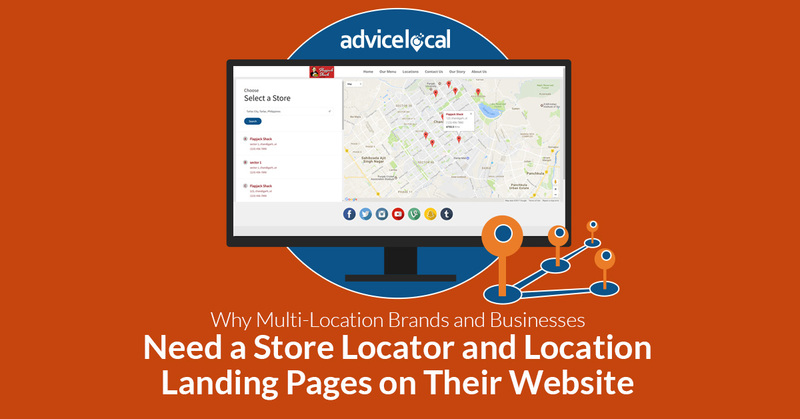 Download our guide, “Putting Multi-Location Businesses on the Map: A Guide to Store Locators and Location Landing Pages” and learn all about it today! If you would like to skip the download and learn more about Advice Locator Pages, request a demo now!